PLEASE NOTE: As of 2015, this blog post is outdated! It discusses customization for LibGuides 1.0, which is no longer supported! If you have LibGuides, you should be on LibGuides 2.0, and this post is not useful to you. I’ll be honest: I didn’t know what LibGuides were until I was well into my library & information science graduate program, and at first I thought they were pretty dorky since they looked so dated. But I’ve since come around, and overall they’re great — easy to create, easy to edit, and fairly reliable as software. The default skin could use some work, though. 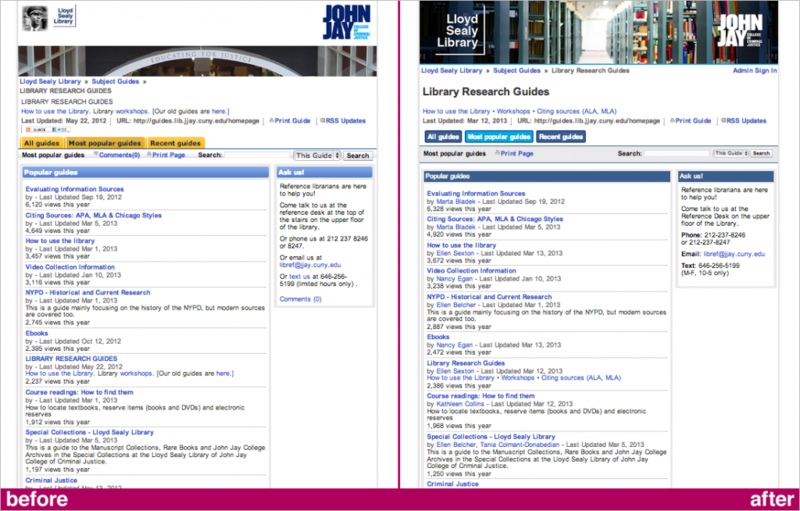 We recently updated the look of John Jay’s LibGuides (we call them Subject Guides) and I thought I’d show you how we did. That’s all we did. Small steps, big improvement! What does emerging tech in the library look like? I was just wondering how to remove the lines that appear between the buttons when using this code. Any ideas on what to change? Thank you for your time. Have a wonderful afternoon! Nice clean modern look — I like it. 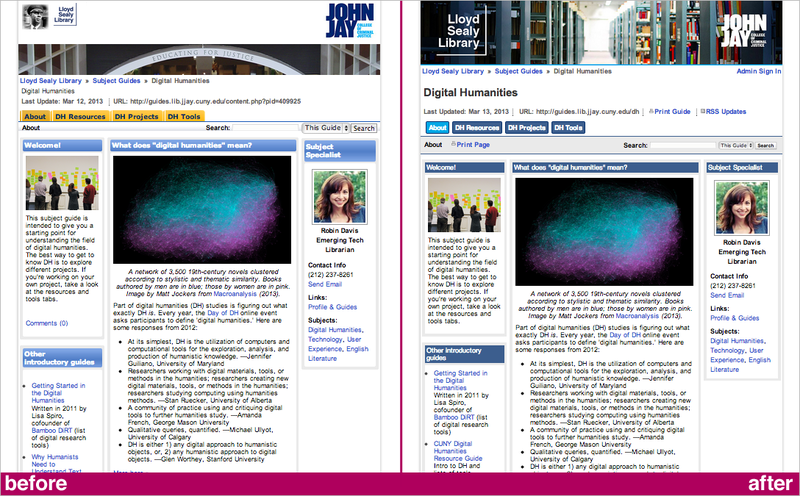 We’re looking at a website redesign in the near future, and it would be the perfect time to freshen up our LibGuides. I was wondering how you handle those LibGuides that have more than one row of tabs; those guides now have one or more rows of buttons. This is super helpful! Going to look into making some of these changes at my library.